The decision to monitor implementation of goals 3, 4, 5 and 13 was primarily because they co-relate with many of the AIWC programmes. AIWC has also linked up many of their own run programmes with the goals and targets and advised branches to report under the categorization. 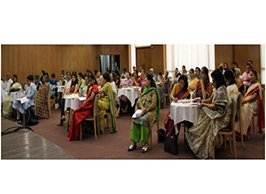 AIWC branches run formal and non-formal education programmes, health and sanitation awareness campaigns, environment protection advocacy and activities through the network of her branches. The organization is also engaged with gender integration into climate change policy work at national as well as global level for past many years. One of the significant paradigm shift of the Sustainable Development Goals (SDGs) formulation from that of the MDG is that the process has been transparent, inclusive and there have been some consultations with the stakeholders. While few CSOs were consulted before the formulation of the SDGs, there has been a little wider outreach effort by the government in recent times. However, there is no mechanism as such with respect to the regular engagement with women’s organization or many other marginalized sections of the society in the area of implementation of the relevant schemes. During the course of the Women 2030 project, based on the consultations and research, we have found that structural barriers like social cultural practices and patriarchy system limit the level of participation of women in the workforce as well as in developmental work. Government has initiated number of schemes for welfare and livelihood of women and adolescent girls, however, due to less popularization, cumbersome availment process or for structural flaws, the schemes have not been satisfying the objectives completely. Other reasons for the developments benefits not reaching the real beneficiaries like women and marginalized group of society are systemic and institutional barriers such as deep rooted patriarchy, corporatocracy, lack of rule of law, armed violence, hunger, multidimensional poverty, erosion of democracy, indifference towards ground realities, corruption, red-tapism, lack of proper implementation, no communication-coordination among departments etc. Monitoring and Review of Sustainable Development Goals – 3, 4 and 13 in India Consultation, Kolkata: The Kolkata Consultation took place on 4th Feb, 2017 and focused on 3, 4 and 13, Health, education and climate change. Concerns were raised on the plight of Anganwadi workers, poor participation of girls in the education sector and insufficient climate change mitigation and adaptation steps. Many women activist from AIWC and other organization asked questions on the accountability and monitoring framework of the SDGs. 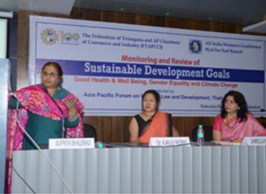 Monitoring and Review of Sustainable Development Goals – 4, 5 and 13 in India Consultation, Hyderabad: The Hyderabad consultation took place on 6th April 2017, based on goals 4, 5 and 13. The consultation was organized in collaboration with The Federation of Telangana and Andhra Pradesh Chambers of Commerce and Industry (FTAPCCI) and conducted on the same format as Kolkata. It provided a good platform to all the like-minded participants to share knowledge and discuss relevant issues. 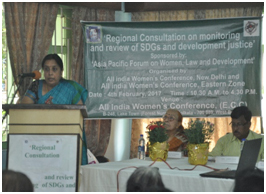 Monitoring and Review of Sustainable Development Goals – 5 and 13 in India Consultation, New Delhi: The New Delhi Consultation was organized on 21st April 2017 and focused primarily on Goal 5 and 13. The consultation was organized in collaboration with Wada Na Todo Abhiyan (WNTA – a network of the members of the civil society to hold government accountable for the proper implementation of SDGs). The inclusion of climate change and gender equality was seemed to be important due to the changing climate and a search for women’s qualitative role in the implementation of climate change policy. The consultation was participated by the members of civil society, representatives from Research and Information System for Developing Countries (RIS, another main agency), members of WNTA, women activist, youth and community members. The issue of women’s participation at decision making level, gender lens in various government policies and factors impeding over all gender justice were discussed in detail. The outcome of all the three consultations are compiled in the final ‘People’s Development Justice Report – 2017. 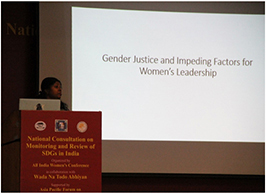 Simultaneously, AIWC has also engaged with WNTA and other organizations in preparing shadow report on Goal 5 which was presented by the civil societies during the recent High Level Political Forum Meeting at United Nations where India was reviewed on the implementation of SDGs. The sustainable development goals with a motto of ‘Leave No One Behind’ has been a tool for an inclusive development programme. It was a visible consensus in the consultations organized by AIWC that government has to involve CSOs and citizens to achieve the targets under the agenda 2030. There was also a consensus that popularization of SDGs is required and it was also felt that with the vast population of youth in India, involving youth in the entire SDG agenda is important. While there is gesture of positive involvement of CSOs by the government agencies, a transparent, inclusive and strategized approach of meaningful engagement of all stakeholders including women’s organization, can make the agenda 2030 a great success. Any government scheme/policy with gender integration strengthens its success. The gender budgeting mandated by the Women & Child Development should be strictly adhered by the all the departments. Popularization of SDGs through all kinds of social media platforms, involvement of schools/colleges/universities/educational institutions etc. A framework for monitoring and review for all SDGs can be outlined by the government and made available to all stakeholders including CSOs. Involvement of CSOs in the formulation and implementation of all government schemes to make it more effective and beneficial. Govt. schemes need to ensure proper end-use co-benefits and that the schemes be pro-poor, climate friendly, gender responsive, youth friendly and truly leave no one behind. Specific Accountability Indicators need to be created and be open for public purview. Consultations on national indicators should include grass root level women, minority community, academics and CSOs working in the field.